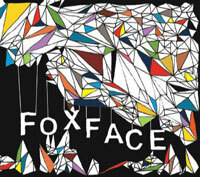 Earlier in the year I mentioned a band from Glasgow called Foxface. The reason I mentioned the band was that one of the three band members, Jenny Bell, according to what I read is from Islay. Good enough reason to mention them on this blog, not forgetting that they also play some nice music. I don't know if they have any plans to play on Islay, but if you're in or near Glasgow tonight you can go to a quite special concert for Foxface: They will celebrate the release of their debut album ‘This Is What Makes Us’ at Stereo in Renfield Lane, Glasgow, this evening. GLASGOW-BASED trio Foxface produced one of the highlights of the Ballads of the Book compilation, and their own album continues to fashion an idiosyncratic link between folk influences, pop melodies and more strident rock'n'roll elements. This Is What Makes Us is a dynamic debut full of contrasts, not least the polar textures of Michael Angus's baritone growl and Jenny Bell's sweet, breathy soprano. Congratulations and good luck for the debut album!